North Atlantic Books, 9781583947241, 288pp. 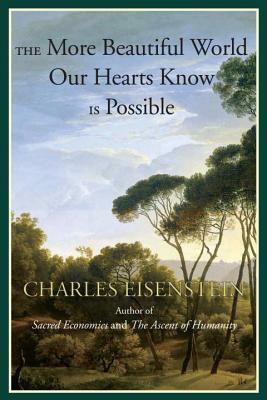 Throughout the book, Eisenstein relates real-life stories showing how small, individual acts of courage, kindness, and self-trust can change our culture’s guiding narrative of separation, which, he shows, has generated the present planetary crisis. He brings to conscious awareness a deep wisdom we all innately know: until we get our selves in order, any action we take—no matter how good our intentions—will ultimately be wrongheaded and wronghearted. Above all, Eisenstein invites us to embrace a radically different understanding of cause and effect, sounding a clarion call to surrender our old worldview of separation, so that we can finally create the more beautiful world our hearts know is possible. With chapters covering separation, interbeing, despair, hope, pain, pleasure, consciousness, and many more, the book invites us to let the old Story of Separation fall away so that we can stand firmly in a Story of Interbeing. Charles Eisenstein is a speaker and writer focusing on themes of civilization, consciousness, money, and human cultural evolution. His viral short films and essays online have established him as a genre-defying social philosopher and countercultural intellectual. Eisenstein graduated from Yale University in 1989 with a degree in Mathematics and Philosophy and spent the next ten years as a Chinese–English translator. The author of Sacred Economics and, Ascent of Humanity, he currently lives in Camp Hill, Pennsylvania. "This is a revolutionary and interactive book—in the sense that it inspires the reader to think out of the ordinary. Eisenstein will be noted in antiquity as one of the seminal and pioneering storytellers of this new world." “It is rare to find, in such digestible portions, so rich a feast for mind and heart." "One does not 'read' this book, but rather interacts with it. And take heed, it will open your heart and mind, arouse ire and derision, and change the way you think about your life. Beautifully written, heart-warming, and thought-provoking, Eisenstein will undoubtedly be noted in history as a pivotal storyteller." "This brilliant and beautifully written book is a must-read for all those who believe our economic system is terminally sick and in need of radical, sacred rehaul. I hope this book begins a serious, worldwide conversation on how we can reinvent our attitude to money." "Brilliant and original, with great depth of insight and understanding. The Ascent of Humanity easily ranks with the works of such giants of our age as David Bohm, Julian Jaynes, Jean Gebser, Alfred North Whitehead...."